It was a dark and stormy night on Thursday Nov thirteenth when the Toronto Chapter of the Canadian Internet Marketing Association met for the first time in history in our office building’s meeting room. This national organization appointed our friend Rob Campbell to the position of President of the newly formed Toronto Chapter! So we reached out with congratulations, offering up a venue for the association’s first gathering. The group that assembled that evening was a typical cross-section of our online society; it was an informal gathering of web marketing professionals representing many different segments of the advertising industry. There were students, scholars, website marketers, SEO practitioners, CEOs, CMOs and policy makers from other organizations. Before the meetup started, everyone took turns trying on a pair of Google Glasses that Ahmed Abdalla brought forth – they were visible on the top of his bicycle helmet when he arrived at the venue, and Rob Campbell asked if he would pass around the device and give everyone a chance to look through the rig. Rob Campbell the President of the Toronto Chapter waxed poetic about the future of online commerce and how our actions and ideas today could shape, protect and improve tomorrow’s web experiences. “There is strength in numbers”, Rob stated, making his case for a membership drive, “We have to be the disciples of the cause and spread the gospel to get as many people as possible to join CIMA” @JoinCIMA. After briefly outlining his vision for the new organization, Campbell asked each of the attendees to say a few words about themselves and articulate their pain points or remedies or ideas for any problem they could identify. How can CIMA make change? Rob Asked. He wanted folks to spell out what they would like to see happen with the group, and what causes are closest to their hearts. 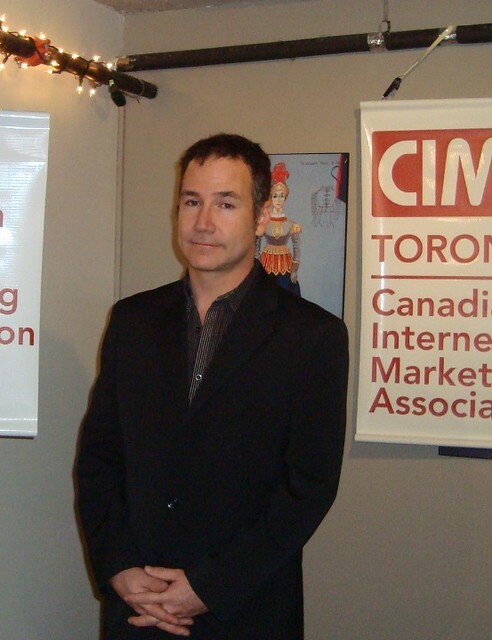 Rob Campbell went on to say that if we all do our jobs right, digital advertising professionals here in Toronto and all across Ontario will soon have a neutral resource to get second opinions, honest appraisals and unbiased reviews of proposals and reports. Its also hoped the Toronto web marketers can evolve this new association into a more prominent voice in federal politics, and a reliable go-to resource for understanding provincial issues and even municipal bylaws concerning web activities. 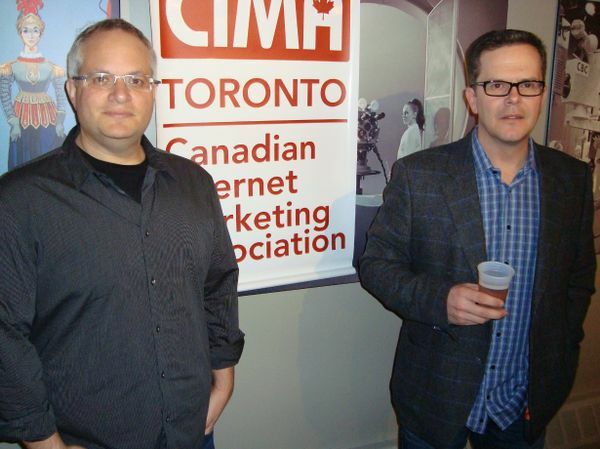 Brian Rotsztein, the President and Founder of CIMA detailed the history of the Canadian Internet Marketing Association, describing how it has grown from an idea and a few lines of code to its present prominence and expansion across Canada. Brian’s opening speech did a wonderful job conveying the greater social, political and technological need for such a group, hinting at its many potential roles down the road. “Sometimes the issues that threaten freedom and liberty on the web are so complex they require a trusted interpreter to break it all down, to look at the legislation. The community needs a voice it can trust, someone who can say yes or no and form an opinion. Of course the membership is free to choose their own path, make their own decisions, and vote with their feet, but they can rest assured that someone they know has already done some checking into things, and has taken the time to do the research. This Round Table Discussion Launched CIMA Toronto. Heightening our need to build muscle and push back, the present government is now in the midst of giving its spies even more power through the passage of Bill C-13, better known as the Cyber bullying Bill, which makes it even easier for law enforcement agencies to surveil Canadians and allows Internet Service Providers to voluntarily turn their information over to the government agencies without consequence, and without notifying their customers. The bill is so broad that even Carol Todd the mother of Amanda Todd, whose heartbreaking death helped inspire C-13 has spoken out against its surveillance provisions. Ahmed Abdalla voiced an unfavourable opinion of CASL the new Canadian Anti Spam Law , which he believes is having a chilling effect on legitimate email marketers. On that subject, James Bunting of BBS Toronto bookkeeping service related a story about how CASL has prevented his business from sending email newsletters to clients. It turns out his marketing manager, like so many others has chosen to negate any potential liability by completely eliminating email newsletters from their arsenal of marketing tools. Here’s James Bunting holding Brian Rotsztein’s Content Marketing Ideas book which was offered up as reward for audience participation and won by Tamarra Levine @TamaraLevine with a photo tweet. Lots was said and stored away in the official minutes as we all pledged to meet again in January 2015. Long live CIMA!